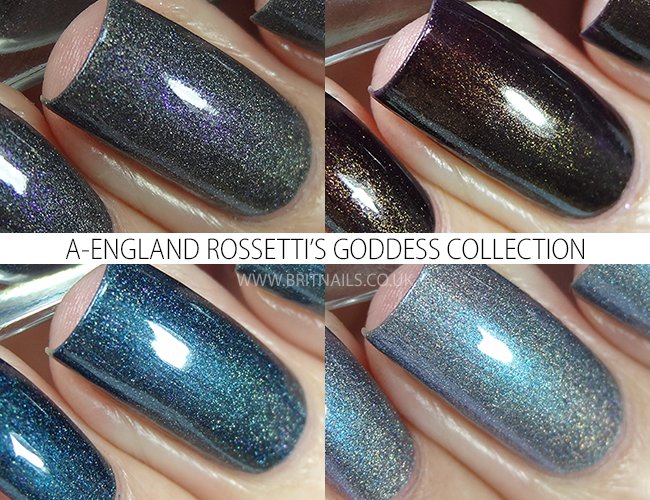 Today I have the brand new Rossetti's Goddess collection from a-england to share with you! We've been treated to 4 captivating new shades inspired by artwork by pre-raphaelite artist Dante Gabriel Rossetti. As always when I receive some new a-england polishes, I find myself immersed in wikipedia reading all about the people behind the inspiration, in this case Dante Gabriel Rossetti and his work Proserpine. I was vaguely familiar with Rossetti but it's always so interesting to find out more! It definitely makes you love the polish even more when you know the back story; although I don't have any official information behind the inspiration I've included a bit from my own research. All 4 shades have a-england's signature smooth, opaque formula that's super easy to apply. I've done my best to describe the shades to you, but as you can imagine they're quite complex and multi-faceted and really need to be seen to garner the full effect! 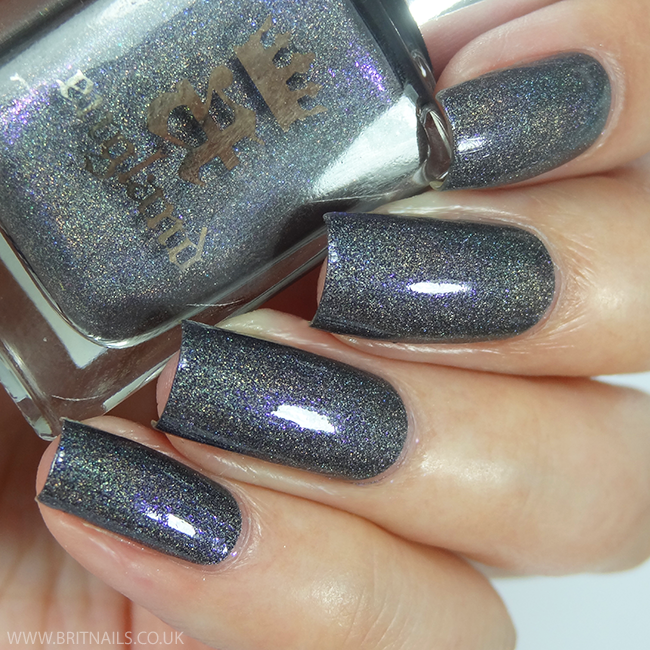 Jane Morris is a steel grey/purple with flashes of purple sparkle and subtle rainbow holo. This appears a darker grey in low light and shade, and takes on a lighter grey in sunlight. I've used 2 coats plus top coat. Inspired by Jane Morris, the beautiful muse of Rossetti and model for his Proserpine painting. Inspired by Rossetti's painting Proserpine, in particular I'm guessing her beautiful teal dress. Inspired again by Proserpine, the captive goddess. Inspired by the symbolic incense burner in Proserpine, an attribute of a goddess. 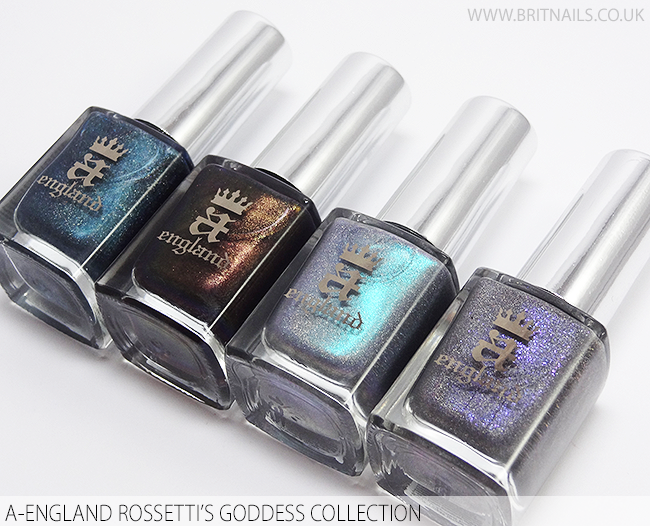 This collection is just stunning and as always I'm impressed by the many dimensions of an a-england polish and the way you can get lost in the history behind them. What do you think? Let me know! - For the rest of the world, check the where to buy page for details of where you can purchase. You captured these so well Allie! The purple shimmer in Jane Morris and the colour shift in Incense Burner! I hope I can do these as much justice as you did!! Just gorgeous! Incense Burner is INSANE! Love these! Oh wow, your swatches are just perfect, you captured the glow so well! Incense Burner looks utterly stunning! Wow, a stunning collection and perfect swatches, as always. I cannot pick a favorite, they are just all too pretty. Spectacular collection! 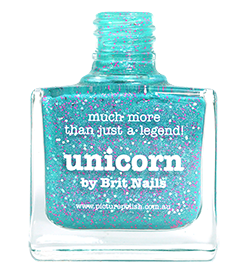 They are all amazing polishes!